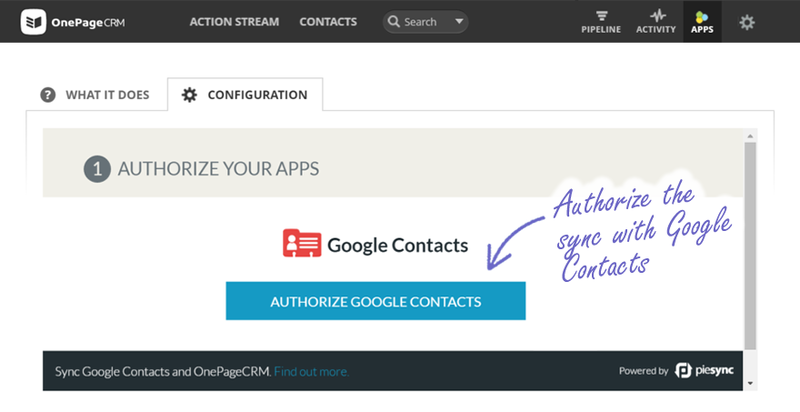 Keeping your contacts in sync between OnePageCRM and Google Contacts is simple thanks to our new integration with PieSync. Using this integration, your contacts will always be the exact same in both systems, so if you add or update a contact in one, it will automatically change in the other. Why set up a sync? You can find the PieSync icon under Apps and Integrations in OnePageCRM. Simply click install and authorize the connection and we’ll do the rest. Your contacts will begin syncing in the background straight away. There are some great options available to customize your sync settings. Sync criteria: Decide on the criteria your contacts must meet in order to be included. For example, if contacts should be a part of a group in Google Contacts (or just all contacts), or if they should have a specific tag in OnePageCRM. Sync direction: Choose whether to send contacts just the one-way (for example, from Google Contacts to OnePageCRM) or both ways with a full sync. Conflict management: If there are duplicates or deleted contacts in either account, you can set how they should be managed, as well as which app you want to win out if a conflict arises (hint OnePageCRM is best). A clean contact list is important for staying focused on what really matters – clear and consistent communication. By integrating your CRM with Google apps and Gmail, you will make sure that your list is always up-to-date. If you want to try out this new integration, sign up to a Free Trial of PieSync from within your OnePageCRM account. Check out our help article for more information about getting set up. If you have any questions or feedback, please comment below or contact me at brianm@onepagecrm.com. How does a small company make its first B2B sale? Will this only sync contacts that exist in OPC or will any Google contact be added? This can be configured as a two-way sync if you wish, so any contacts in Google Contacts currently or in future should push across to OnePageCRM automatically and vice versa. So you’re contacts can be the same in both systems at all times, if that’s what you want. Let me know if you’re having any issues with getting set up with it. I’ve set up iCloud to sync with google contacts and I’m also I’m using Full Contact Card Reader for business cards having it all in one place is fantastic. Can this be done using WorkFlow, IFTTT, or Zapier? Seems a bit steep for a simple sync of contacts…. 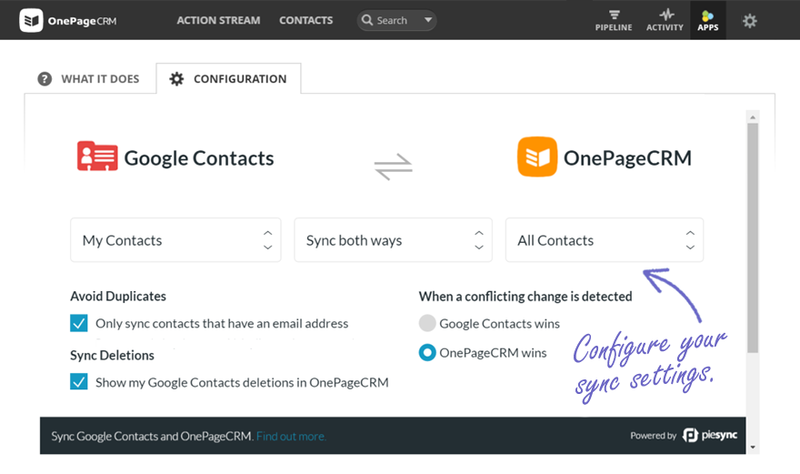 The main benefit with PieSync is that you will have a full contact sync between Google Contacts and OnePageCRM, rather than simply pushing a new contact from one to the other. PieSync will keep all contact information the same between both apps and in real time. Zapier for example is a great tool, but it requires an action to trigger the contact push. For example, if you add a contact to Google Contacts then you can push it to OnePageCRM, but if you update the same contact in OnePageCRM, it will not be updated in Google Contacts. I do not think this is as complete of a solution as PieSync in this scenario. If you have any more questions on this, please let me know.